The Baseline® Series 8950 Multipoint Sampler is designed to interface with Baseline®'s Series 8900 Gas Chromatograph. 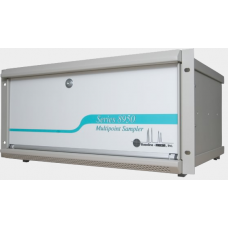 The multipoint sampler expands the sampling capabilities of the Series 8900 from 1 to potentially greater than 32 sampling points depending on the configuration. Gas samples are simultaneously and continuously taken from all areas being monitored. When a gas sample from a designated area is to be analyzed, the stream selection valve in the Series 8950 Multipoint Sampler is actuated. This diverts the sample to the Series 8900 GC for analysis. Main control of the multi-point sampler is from the Series 8900 Gas Analyzer. The sample sequence can be programmed in any order to monitor critical locations more frequently. Analog outputs and 3 alarm set points can be individually set for each gas at each location as well. 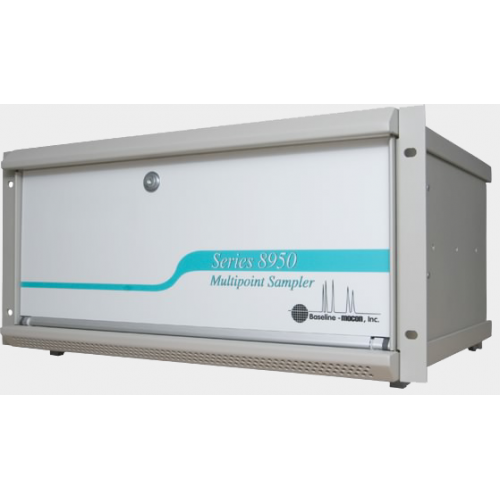 The Series 8900 Gas Chromatograph will support multiple samplers. The combination of ports, analog outputs, and relays cannot exceed system totals. Multipoint capability may not be available internally for all configurations of the Series 8900 Gas Chromatogaph due to other options and space availability, consult Baseline®.